Refreshing to go to an unpounced up pub. Kilburn's changed over the years and more and more pubs have been done up. 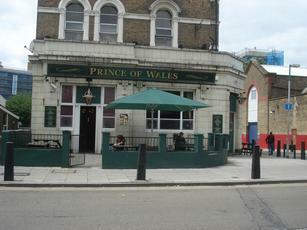 Yes, this one's rough round the edges but the landlady and landlord are friendly, no bother from the locals. Kareoke on a Sat night which can be fun, entertaining or depressing depending on who's singing. There�s no real ale; and no food during a weekday lunchtime. Actually it�s a very basic and scruffy locals�pub. Nothing to recommend it as Far as I can see. Very much a locals pub. Nobody said anything but there seemed to be a great deal of interest in my presence, a couple of the guys must have averted their eyes from the Racing Post for at least 20 seconds. When I was there 'At the races' or whatever it is called was on the TVs which is always a real turn off for me.